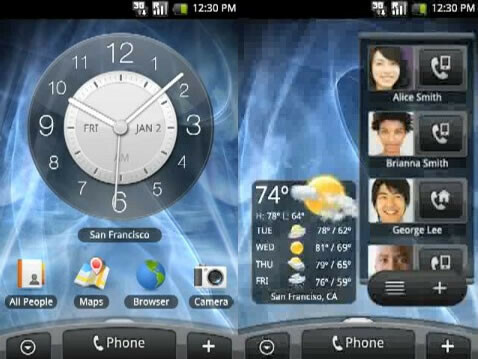 The screen shot below comes from a video that is said to demonstrate the Android powered HTC Hero. Look at the new home page and you'll see a nice change from the clock in the sky picture that we've seen countless times. The question is whether this new look is related to the upcoming Android 2.0 "Donut" OS or if it is a personalization from the manufacturer similar to the TouchFLO 3D that HTC uses to help navigation on their Windows Mobile devices. The design is heavy on the widgets and the infamous analog clock is back and actually takes up more of the real estate in the screen shot on the left. When we last reported on the HTC Hero, we passed along information that the handset is expected to see a third quarter release. The phone showed up on the road map for carrier Orange France but a definitive release date and pricing has not been mentioned. So what do you think of the design? Lame... no offense There's a bit much going on; I think it would look much better if it were a bit more minimalistic... Like they could have had four rating orbs surrounding the clock, each one custom set to a particular application. Of course, the phone short cut could be at the bottom, like is, and then there could be a pulsating orb in the upper corner that pulsates a certain color when you have a new email or something. Yeah I don't know if Im liking all those widgets on the screen at a time.